The use for mathematical models of natural phenomena has underpinned science and engineering for centuries, but until the advent of modern computational methods and devices, the full utility of most of these models stood outside the reach of the scientific and engineering communities. Since World War II, advances in computational methods have transformed the way engineering and science is done throughout the world. Today, theories of mechanics of solids and fluids, electromagnetism, heat transfer, plasma physics, and other scientific disciplines are implemented through computational methods in engineering design, manufacturing, and in studying broad classes of physical phenomena. The discipline concerned with the application of computational methods and devices to these ends is called computational mechanics, and it has emerged as a key area of research, education, and application throughout the world. The international group of scholars and practitioners of this new discipline founded the international Association of Computational Mechanics (IACM) to promote advances in computational mechanics. For the purposes of the Association we define the subject of Computational Mechanics as the development and application of numerical methods and digital computers to the solution of problems posed by Engineering and Applied Science with the objectives of understanding and harnessing the resources of nature. While Computational Solid Mechanics (CSM) and Computational Fluid Dynamics (CFD) are at the core of our activity, such subjects as Thermodynamics, Electro Magnetism, Rigid Body Mechanics, Control Systems and some aspects of Particle Physics fall naturally within the scope of the definition. Indeed the provision of a common forum for discussion, education and research information transfer between the diverse disciplines represented is the main “raison d’etre” of the Association. The first attempt to bring together this community followed a letter from three leading scientists working in this field, R.H. Gallagher, J.T. Oden and O.C. Zienkiewicz who called a meeting of 12 persons at Georgia Institute of Technology, Atlanta, Georgia, U.S.A. in April 1981 to form a group of International Centers of Computational Mechanics. This led to the formal announcement of IACM and the establishment of a Founding Council and a Constitution. IACM was formally established, the General and Executive Councils confirmed and the Constitution approved. With the Constitution giving equal emphasis to the three geographical Regions of Americas, Euro-Africa and Australia-Asia a rotation of such World Congresses between the regions on a four year cycle was established. 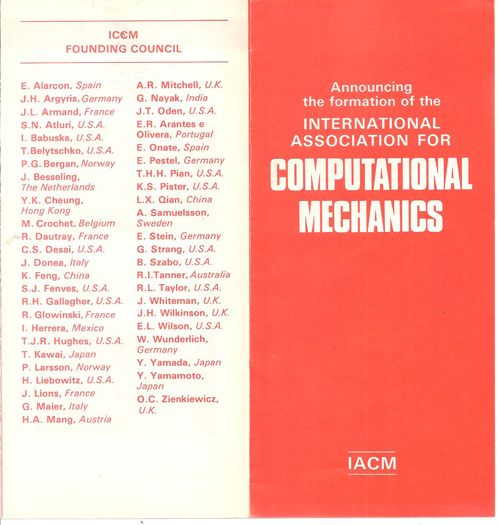 The International Association of Computational Mechanics (IACM) was founded to promote advances in computational mechanics by the international group of scholars and practitioners of this new discipline. IACM has since 1984 been affiliated to the International Union of Theoretical and Applied Mechanics (IUTAM). Our thanks to Prof. Walter Wunderlich for this historical document.